I never get tired of watching Braveheart over and over again – that is just one movie that is worth diving into, with all the love, passion, intrigue and well, for the more bloodthirsty audience, battles. 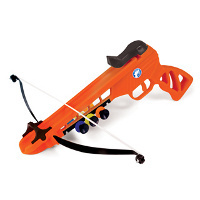 No pansy pilot-less drones bombing targets who wield nothing but sticks and stones for protection – here is what unbridled testosterone is all about, with the Petron Fun Hand Bow. Archers of yore were useful in cutting down an advancing army in size, but when the line of defense gets breached, archers are in deep trouble – unless you’re Legolas who is also a skilled close quarter combat participant. Well, relive those Braveheart moments with the £11.99 Petron Fun Hand Bow, where it relies on lightweight plastic arrows to hit the target. These projectiles will feature suckers on its tips, which means it ought to stick onto most smooth surfaces without missing a beat.